By creating and serving dishes made entirely from ingredients made through the process of pollination, we aim to show Cardiff just how important bees and other pollinators are when it comes to our daily diet. If we can still eat delicious dishes that these businesses are serving, imagine how bland and boring life would be if pollinators such as bees disappeared from the planet. UK bees are declining at a worrying rate, with even managed colonies falling by 53% between 1985 and 2006, due to agricultural changes, chemicals found in agricultural fertilisers and pesticides, and growing evidence that pesticides affect bee health. Bees pollinate 75% of the worlds most important crops. Without them our food would be threatened, as well as our economy, costing at least £1.8 billion per year to replace them with hand pollination. Bee Friendly is a subgroup of Friends of the Earth Cymru, and our mission is to make Cardiff the first bee-friendly city, via council accreditation. By building a good relationship with the local community we can achieve our mission and educate people on how best to make small changes that have big impacts. 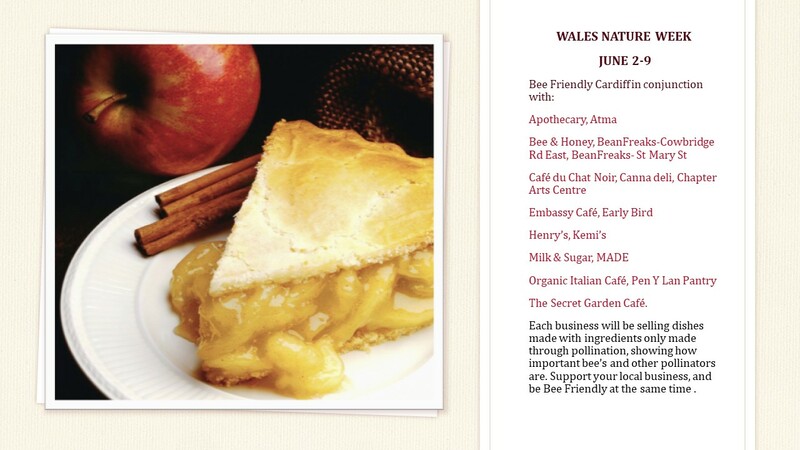 The local businesses will all be serving a dish made entirely with just pollinated ingredients. The businesses involved are: Café du Chat Noir, Penylan Pantry, The Secret Garden Café, Apothecary, Bee and Honey, Canna Deli, BeanFreaks- Cowbridge Rd East, Beanfreaks, St. Mary St, Kemi’s, Chapter Arts Centre, Atma, Milk and Sugar, Organicafe, MADE, Early Bird, Henry’s and Embassy Café. We encourage people to post pictures of the dishes they’ve tried on our Facebook page and let us know what they think of them. We look forward to hearing what people think of a bee-free world.